International Festival, organized by the International Student Advisory Board (ISAB) is an annual celebration of Reed's cultural diversity. The center of the festival was the student union, which had vibrant flags of all the countries represented at Reed draped across its rafters. "I didn't know Reed had students from so many countries," remarked one observer who dropped into the SU because he heard music and laughter streaming out. That was exactly one of the reasons why ISAB was eager to promote the presence of the 116 international students from 35 nations at Reed by having everyone share a piece of their culture. On the menu were fresh hand-rolled sushi made by the Japanese dorm, tortilla española by the Spanish house, South Indian tamarind rice by Jayasri Narasimhan '12, Chinese tea eggs and Singaporean sesame balls brought by Andrea Lim '15, Vietnamese shrimp rice paper rolls and Vietnamese shrimp noodle salad cooked by Alicia Pang '13, Greek trachanas by Orestis Papaioannou '15, and last, but not least, Taiwanese grass jelly with taro and sweet potato balls and Japanese azuki beans with rice balls, prepared by the Asian Student Union. International Festival also celebrated the contribution of Reed's language scholars. Reed supports five language houses that represent the five modern languages taught at Reed: French, German, Russian, Spanish, and Chinese. 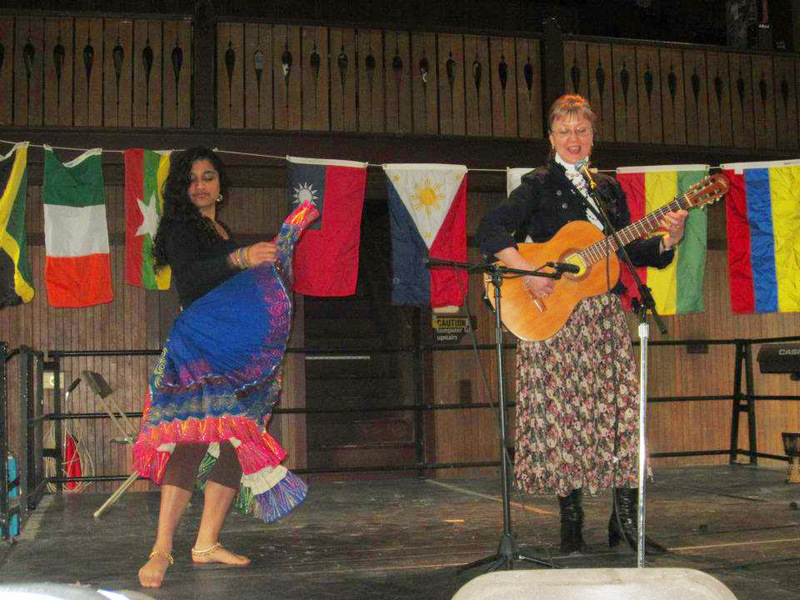 One or two native speakers of each language are brought to Reed every year to support the language house and classes. This year's language scholars recited poetry at the festival but switched it up by having each scholar read a few lines in a language other than their own. Performances included a gypsy song and dance routine by Indumathi Manohar '12 and Russian music teacher Natalia Hougen, Ghanaian music by Paapa hMensa '15, Irish dancing by Kathryn Linthicum '13, and a stirring rendition of Vasco Rossi's "Albachiara" by Chiara Packard '14. The evening ended with a Bangladeshi pop dance performance by Nisma Elias '12 (yes, that's me, if you are wondering) joined spontaneously by other members of the audience onstage who wanted to dance to the infectious "Jatrabala" number as well. If you couldn't attend this year's thrilling festival, keep your eyes peeled for the one in 2013!